In the previous section, Indexing Part 1, we’ve seen that building an index for frequently used attributes considerably increases the efficiency of a query. In this section we’ll discuss the most widely used index implementation: the B+ Tree. 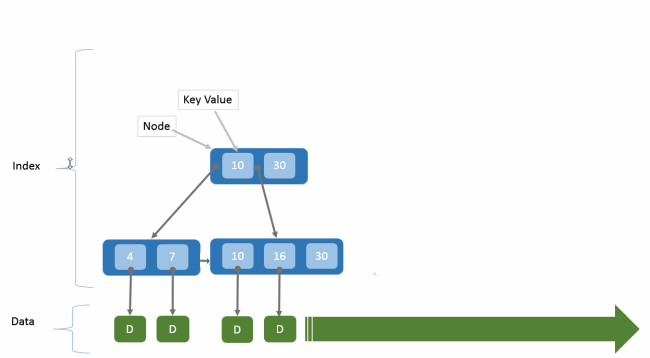 Each node of a B+ tree is a page, a block of data. A page is the transfer unit to disk. We are already aware that a table spans on many blocks of data. We can picture this by having the tree analogous to the table, the nodes analogous to the blocks of data and we have to keep in mind that each block of data contains multiple rows. For now we’ve talked about two things stored on a disk : the index and the data. The index (in blue below) points at the data (in green below). We clearly notice now that creating an index takes extra space on the disk. one pointer towards the data. Having this tree structure (and not only a sequential linked list structure) helps for insertion and deletion complexities: they have a logarithmic running time. How do we recognize B+ tree? Let’s say d is the number of references that a node has to its children. Step 1: If node X has empty space, insert (key, ref) into the node. Let’s go through a few examples. Assume we have 4 rows per page and we’ve inserted the following set of key values : 2, 3, 5, 7, 11, 17, 19, 23, 29, 31. 1) If we want to insert 2, and then 3, and then 5, we just follow the Step 1 of the algorithm (node has empty space). 2) Now let’s insert 7. Step 2: we notice from part 1 that node X is already full. 2C) node X was indeed a leaf : the minimum value of 2nd node X2 is 5. We simply insert it into the parent node by repeating Step 1 from the algorithm (because yes, the parent node has empty space) . Step 1 but at the parent’s node: there is space, stop. Step 1: we notice from part 2 that node X has space. Step 1: there was space, we insert and then we stop. Step 1: there is no more space, continue. Step 1 but at the parent’s node: there is no space, continue. This simulator is pretty neat for testing your own implementations of B+ trees (many thanks to Joy & Graham from New Zealand). Now why are we using B+ trees? We notice that, unlike traversing a linked list, accessing any part of the tree requires visiting only a few nodes. Also, increasing the number of child nodes is decreasing the depth of the tree, hence decreasing the number of “hops” (time consuming disk reads) required.